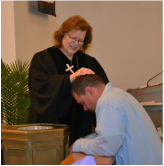 We are happy to do baptisms during our Sunday worship service. ​ or call the church office at (330) 652-6614. “Through baptism we are initiated into Christ’s holy church, incorporated into God’s mighty acts of salvation, and given new birth through water and the Spirit.” United Methodist Hymnal, p. 33 With those words, Methodists begin a service of baptism. Baptism is sacred to Methodists as to all Christians. Yet questions are often asked about what Methodists believe about baptism. How is baptism administered? Why are infants baptized? What does Scripture say concerning baptism? We hope this helps to address those questions. In The United Methodist Church, a person can be baptized either by sprinkling (most common and nearly 100% of all baptisms at Ohltown United Methodist employ the practice of sprinkling), pouring, or immersion (least common). It also accepts baptisms of other Christian denominations; so if you join from another church you do not need to be baptized again. ​The pastor will call those to be baptized to the front of the church. The individual/parents and or sponsors will stand beside the pastor facing the congregation. The pastor will give the examination of faith to the individual or parents who will answer on the child’s behalf. After the examination, the pastor baptize him/her and then present them to the congregation. They will be given the Certificate of Baptism and other symbols by the pastor or Lay Leader and then can return to their seat. No, salvation is a lifelong process during which we must continue to respond to God's grace. Baptism offers the promise that the Holy Spirit will always be working in our lives, but salvation requires our acceptance of that grace, trust in Christ, and ongoing growth in holiness as long as we live.